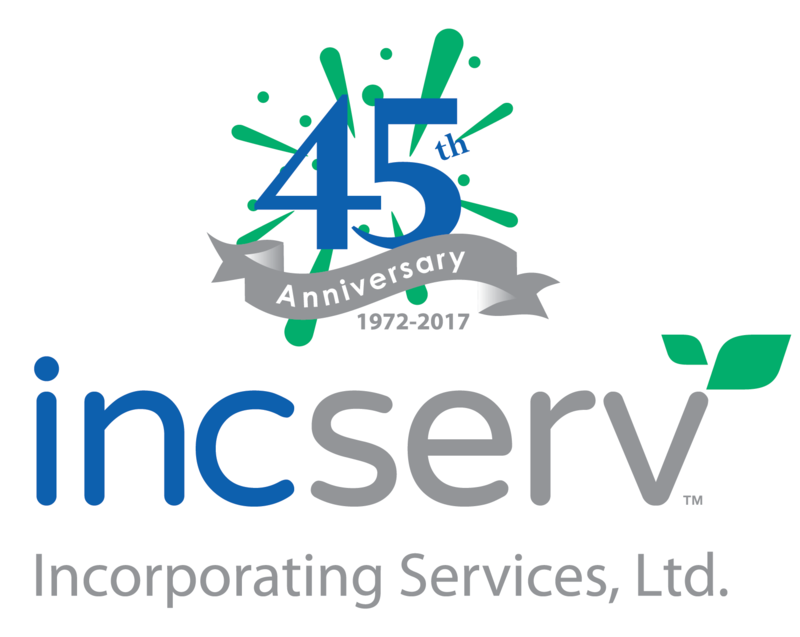 June 28, 2017 marked the 45thanniversary of Incorporating Services, Ltd. Formed in 1972 as a branch of a Delaware law firm, Incserv has grown from a small local business venture among colleagues to a multi-brand, multi-channel international business with a network across the nation. Incserv started out offering simple corporate formation and registered agent services, but has expanded through the years and now offers a plethora of services within their four major brand categories: Corporate Services, Registered Agent Services, Uniform Commercial Code (UCC) & Lien Services, and Federal Agency & Embassy Services. Incserv’s services have grown and their reach stretches across the globe, but they have not forgotten their humble beginning and continually find ways to give back to the local communities they do business in. A variety of product enhancements and events mark the celebration of this notable 45th anniversary for Incserv. In March, Incserv revealed a new logo, product branding, website revamp, and updated client portal to kick-off the celebration. Product enhancements include new tiers and options for annual report compliance, mail forwarding, and virtual office services. In-office celebrations will continue through the month, culminating with a group community service effort. Incserv’s Delaware headquarters is partnering with the Central Delaware Habitat for Humanity to host a Framing Frenzy. Incserv staff will work together to frame a new home, which will later be transported to its permanent foundation in the local community. “The growth Incserv has experienced in these 45 years is remarkable, but we couldn’t have done it without our amazing staff and the support of our local communities. As we celebrate our anniversary, we also want to thank our employees and celebrate the community”, says Joshua Twilley, Incserv President. Curious about all the services Incserv has to offer now? Take a look around the site or contact us for more information.